Home > Background Check > How Much does a Background Check Cost? Background checks for official purposes are usually priced on a cost per search basis that can range anywhere from $10 – $200 depending on the source and the information needed (the more information, the higher the cost). Background checks for informational purposes (which are usually internet based) may be priced on a cost per search or based on unlimited searches for a certain time period. This cost can range from as little as $5 – $30. The purpose of a background check can be anything from informational purposes (i.e. simple curiosity) to official purposes like pre-employment screening or for a firearms purchase. Generally speaking, the cost of a background check for an official purpose will be higher than informational public records checks. This is largely due to the fact that the record information gathered for official purposes is required by law to be guaranteed for accuracy to a much higher degree then the information in an informational background check, which often leads to a more labor-intensive information gathering process. 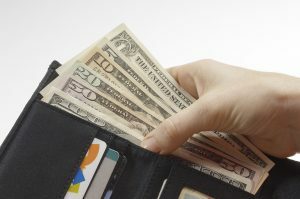 Given that many informational background check companies offer unlimited searches while background checks conducted for official purposes are usually charged on a cost per search (or cost per “hit” basis), the difference in cost can become even more pronounced when multiple searches are needed. Some states do offer low or no-cost options for volunteer screening to charities, but this is not universally offered. In the same vein as the purpose of a background check, the specific information needed in a background check can also determine the cost involved. Not surprisingly, the more extensive the information required, the higher the cost. Some background checks may only cover one specific state or one specific type of information (i.e. criminal records) which would come at a lower cost than a comprehensive national background check. Other points of information – such as education/work experience or social media analysis – are not part of the public record and must be independently checked and evaluated, which adds to the time involved (and cost). And while most background checks only require some personal data and identifying numbers (such as a social security or driver’s license number), others may require fingerprints for analysis and screening, which – again – drives up the cost. In contrast, most informational background checks provide all the national public records information available by default for the set fee to increase the likelihood of customer satisfaction (though this approach sometimes at the cost of accuracy). Where a background check is commissioned also plays a huge role in the cost. Web based background checks – regardless of purpose – are generally much lower cost than running a background check through a lawyer or private investigator (where you are often paying disproportionately more for their time than the information). Ultimately, the lowest cost option is almost always going to be the informational, online based public records searches that start from around $10. The highest cost option would be hiring a private investigator or lawyer to perform a comprehensive background check which may reach up to $200. Aside from cost, there are distinct benefits and limitations for each type of search, so be sure to check out our background check page for the full story!